The following letter was passed to me today in response to the order by the Grand Master of Michigan severing recognition with the Shrine. See here for the first part of this story and the Grand Master's Letter. By now you have received or been informed of the actions of the Grand Master of Michigan expelling Illustrious Sir Craig H. Hatch from Masonry. As you know, there are two sides to every story. In this letter I will inform you of the material facts that have come to my attention, cite our Shrine Law and present my conclusions based upon our Shrine Law. Some time ago, the Elf Khurafeh Potentate, Craig Hatch, was arrested and charged with violating the Michigan Gaming Control and Revenue Act, a felony punishable by a year or more in jail. At his court appearance in February of 2011 Potentate Hatch and an Assistant Attorney General for the State of Michigan entered into a confidential “plea and sentence agreement” that included a plea of “guilty” by Potentate Hatch. According to Potentate Hatch’s attorney, the guilty plea was taken under advisement and an Order Delaying Sentence was entered by the Judge and the case was set for a return date in February, 2012. The final outcome of the case at that time is uncertain and among the possible results the charge against Potentate Hatch could be dismissed. There has never been any Masonic trial of Potentate Hatch; never been any Shrine trial of Potentate Hatch; never been any criminal or civil trial of Potentate Hatch. However, on June 14, 2011, the newly installed Grand Master of Michigan, Frederick Kaiser, issued a letter in which he ruled that the term “convicted” would henceforth be defined as either an adjudication of guilt(by either a judge or jury) or by a plea of guilty. Then, in July, the Grand Master expelled Potentate Hatch from Masonry for the stated reason that Potentate Hatch was “convicted” of a crime punishable by incarceration of one or more years. An appeal of this order to the Grand lodge on behalf of Potentate Hatch has been referred to the appropriate Committee for consideration and the Committee’s report at the Annual Communication on June 2, 2012. I, as Imperial Potentate, was extremely distressed by the foregoing. Nonetheless, I asked my representatives to communicate with Potentate Hatch in an effort to present a resolution to the Grand Master that would be satisfactory to him. My representatives approached Potentate Hatch and stressed the sensitivity of the situation between the two bodies and implored him to voluntarily agree not to attend any tiled meeting or ceremonial of Masonry or the Shrine. 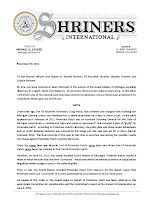 So, even though he was in good standing with the Shrine (as the appeal of his expulsion was not final), he agreed to this recommendation for the good of peace and harmony between the Grand Lodge of Michigan and Shriners International. 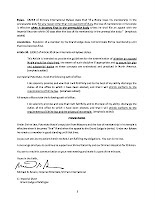 Thereupon, on November 1, 2011 I issued a letter to Potentate Hatch confirming his non-attendance. I believed that this would satisfy the Grand Master within the parameters of Shrine Law. 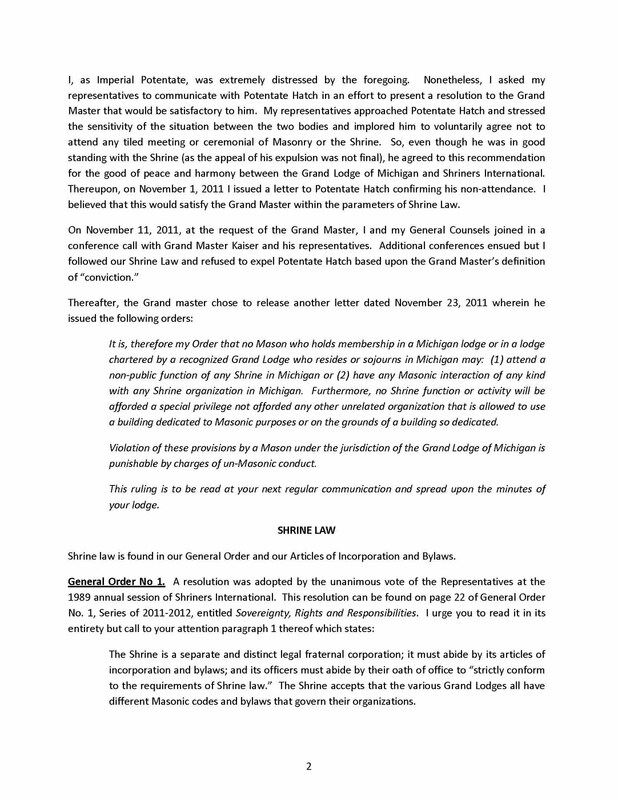 It is, therefore my Order that no Mason who holds membership in a Michigan lodge or in a lodge chartered by a recognized Grand Lodge who resides or sojourns in Michigan may: (1) attend a non-public function of any Shrine in Michigan or (2) have any Masonic interaction of any kind with any Shrine organization in Michigan. Furthermore, no Shrine function or activity will be afforded a special privilege not afforded any other unrelated organization that is allowed to use a building dedicated to Masonic purposes or on the grounds of a building so dedicated. 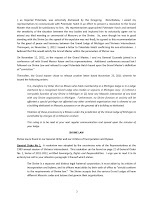 Violation of these provisions by a Mason under the jurisdiction of the Grand Lodge of Michigan is punishable by charges of un-Masonic conduct. This ruling is to be read at your next regular communication and spread upon the minutes of your lodge. Shrine law is found in our General Order and our Articles of Incorporation and Bylaws. The Shrine is a separate and distinct legal fraternal corporation; it must abide by its articles of incorporation and bylaws; and its officers must abide by their oath of office to “strictly conform to the requirements of Shrine law.” The Shrine accepts that the various Grand Lodges all have different Masonic codes and bylaws that govern their organizations. Annotation. Expulsion of a member by his Grand Lodge does not terminate Shrine membership until that loss becomes final. Under Shrine Law, Potentate Hatch’s expulsion from Masonry and the loss of membership in his temple is effective when it becomes “final” if and when the appeal to the Grand Lodge is denied. Under our Bylaws he remains a member in good standing until that time. As you can see, by my actions herein recited, I am fulfilling my obligations. You can do no less. I encourage all of you to continue to support our Shrine fraternity and our Shriners Hospitals for Children. You are to read this communication at your next meeting and make it a part of the minutes. The children have nothing to do with it. Nothing about the situation prevents anyone from donating to the Shrine Hospitals, fundraising, or volunteer their time to the Shrine Hospitals cause. 1. People need to stop using the children or Shrine Hospital as a crutch in this situation. 2. People need to stop playing armchair quarterback on the situation. Not sure about this... but it seems like the comment page of a popular blog that touches on Masonic subject is precisely the place where people *should* "armchair quarterback" this. Okay - Let me get this straight... He plead guilty in Feb 2011, but is now recanting that? Seems to me that the GM did the correct thing in suspending him. If the conviction is "overturned" then he can be re-instated. Why would an appendent body put up such a fight? At his court appearance in February of 2011 Potentate Hatch ... entered ... a plea of “guilty". "There has never been any criminal or civil trial of Potentate Hatch." tells me that the Brother authoring this has some concerning lack of insight about how the justice system works. Especially when he then puts convicted in quotation marks, as if a guilty plea doesn't really count. Yes, there are a lot of potential outcomes at sentencing, but short of expunging the record, the conviction should stand. With an appeal pending, what is Brother Hatch's actual status according to Michigan Masonic Law? Is there a conflict between the Laws of the two bodies regarding the status of the Brother? Long experience tells me that it is pretty much futile to go against the grain of a Grand Master. Maybe the Shrine should just give up its Masonic membership requirement. I for one wouldn't miss it. Actually, the children are being hurt on this because it's taking staff time and leadership time away from helping with the hospitals. When we as Masons have to resort to legalese (Is it conviction, or is it a plea bargain? Is he 'guilty' in the eyes of the state, but not yet 'guilty' in the eyes of the Grand Lodge) we have already lost. We have promised to be honorable men, men of character, and men who obey the laws of our state and nation. If a person broke the law of the State of Michigan they should willingly tender their masonic membership because they have fallen out of the social contract. As a brand new EA trying to understand fully my obligations it seems to me that some masons forget the importance of the blue lodge and how over time those obligations fade in importance. It also seems to me that the shrine is a product of our commitment to charity but are we not suppose to be working on ourselves first? Are we not suppose hold each other accountable? The shrine in my opinion should be harder on Mr. Hatch than the GL but the brothers who also are shriners have failed themselves in this situation in my opinion. Plus any lawyer can tell you a guilty plea is the same as a guilty conviction. I joined the Masons to be a shriner but I will never wear a fez after reading this and I'm not in this jurisdiction. Mine was not a "blame statement - merely a question with an opinion. But, since you bring it up - Both bodies are guilty of letting this go for too long without taking appropriate actions. On your point - If the Potentate plead guilty in Feb, Why did neither the Shrine, nor the GL, take any actions. I am sure that it was not brought to the attention of either body for weeks/months, and investigation takes more time so June/July is probably a good time-line. It is Masonic law that once a Brother is convicted - in any court of record - that the Lodge must notify the GM - who has the authority to suspend/expel the brother. The suspended/expelled brother can then appeal that decision. 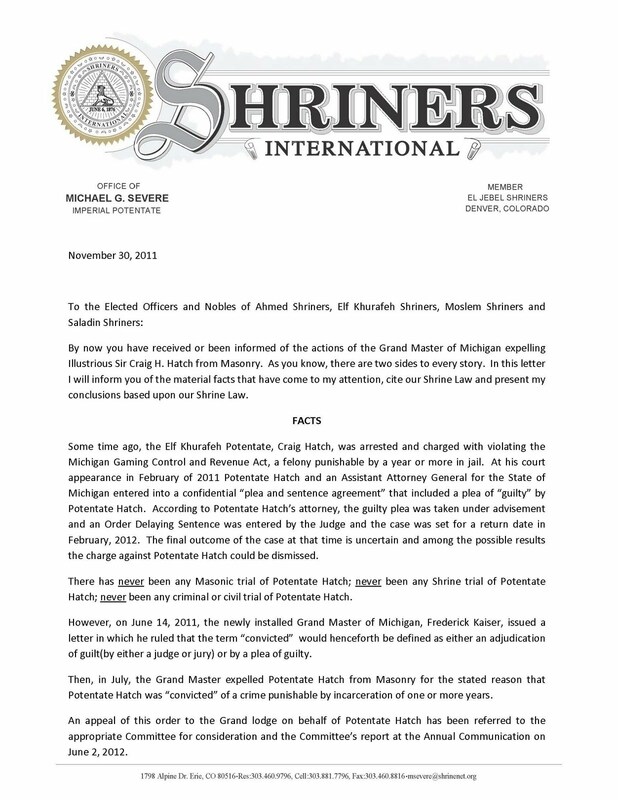 Why is the Michigan Shrine risking so much to help someone who plead guilty to illegal gambling? The Shrine is going to allow itself to self-destruct over an illegal gambler? You can argue all the words you want but the pure facts are that Hatch engaged in illegal gambling and got caught so red handed that he plead guilty in a plea bargain to avoid the likely jury conviction on a worse crime. He should not be a mason... regardless of the attempt to split hairs about the words. If he should not be a mason at all, why is the Shrine insisting on keeping him when being a mason is required? Terrible. No one is hiding behind the children. It seems like others are hiding behind their "perceived" rank. Oh wait no one is of higher rank than a Master Mason. Oh wait you forgot to read Animal Farm. Some are more equal than others even within our fraternities. Out with the good ole' boys. You wonder why membership rolls dipped so hard for so long. Hiding behind the children? Seems like you are apart of the old boy network. Sounds like you have a personal interest rather than casual observance. So much for no degree higher than a Master Mason. Oh wait even the Animal Farm resides within Masonry. Perhaps a few of you should have joined the Odd Fellows instead. Bunch of odd fellows indeed. We need to learn the lesson again. No one should ever be expelled without a trial. The most that should be possible without a trial is a temporary suspension pending a trial or the next grand lodge meeting. There is probably much to read between the lines. "Diversion Agreements" by whatever terminology are often seen in criminal prosecutions. Usually there will be an agreed delay in conjunction with good behavior and good deeds by the accused. Then it is not unusual for an agreed change of plea and dismissal of charges to result. I know nothing about the details of this case, but I do know that there are two sides to every story. That is why fair processes and a fair trial should apply to everyone, even Freemasons. We are not on a battlefield. What bothers me, and I have no horse in this race at all, is that the plea was entered in Feb 2011, the New Grand Master took his office after that time, he than preceded to change the definition in the by-laws and then applied them ex-post-facto this situation. It has been my experience that no change to Masonic by-laws that deal with juris-prudence has a clause that allows them to be applied retroactive. It seems to me that in this case there is more going on than is being said for a by-law to be changed than applied. MW Bro. Frank, I can respect your position in this matter and your concerns in this tragedy, but the man confessed to the felony; is that not enough? I could understand what is being advocated here if the Brother overtly and continuously held to his innocence, but such is not the case here. Imperial Shrine is making rulings here to trump themselves over Craft Masonry and that should not be accepted by the Shrine or any Grand Lodge. I am a Shriner and I love being a Shriner, but I am first a Mason and I will continue to remain mindful of whence I came and I hope that I am not the minority in this endeavor. Those brethren who speaks the words but do not live by them tend to be the ones who causes grief for the rest of us. Let us all remember that we are brothers not because we protect each other from our own stupidity and foolishness, but rather we are brothers because we hold each other to the highest standards and such a life is not an easy one. Mr. Hatch confessed to a felony and his own confession should render him no further advocacy here. It is a shame that this occurred at all and I wish the brethren of Michigan the best in resolving this. May the Great Architect keep each of you safe. Yes there has been a trial for Hacth. Go to http://mdocweb.state.mi.us/otis2/otis2profile.aspx?mdocNumber=797447. And you will see that in the STATE of Mi. that he has aslso been SENTENCES to one year Probation till Feb. of 2012, I do not know what the laws state in Fl. but he has been to trail. I cannot speak for the state of Michigan but in my state we call it a plea in abeyance. This means no plea is made or taken by the court. The defendant is given conditions of probation and if they complete it the charge is dismissed. If the person violates the plea in abeyance the guilty plea is entered and court requests a presentence report and 45 days the person is sentenced. No in Masonry we do not need a conviction. But a trial needs to be held. Granted it will be a short trial because all they will need to present is the court documents showing the plea of guilt. Apparently this is not the only battle that the Shrine is fighting. There is a similar new edict from the GL of Arkansas regarding a situation that while different has some interesting notes. This is the second time in about 13 years that that GL has placed the Shrine outside Masonic Law. 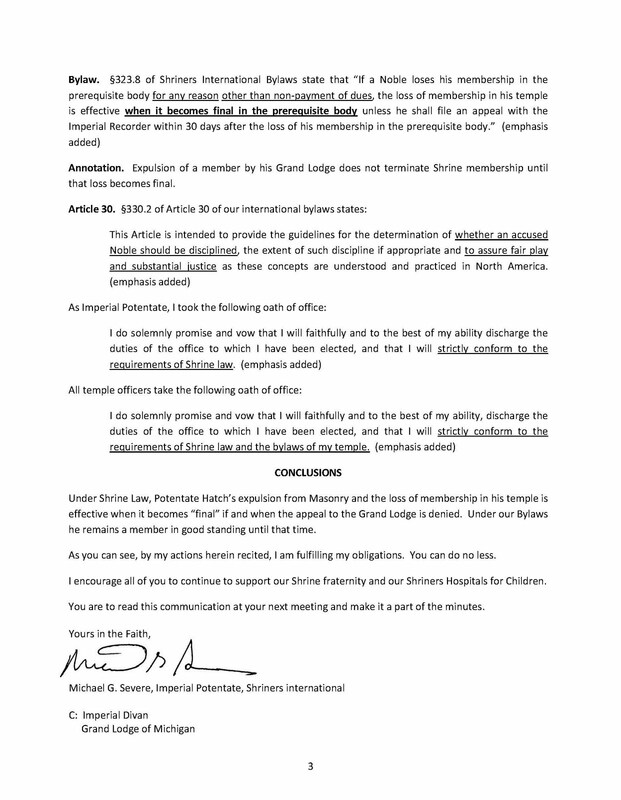 Has Shriners International become so egotist that they feel they have the by-laws to overrule a Grand Master? Shriners have no business butting into a “local” conflict. They seem to have forgotten that there would be no Shriners without us lowly Masons. Either you support your obligation to your state Grand Lodge or you don’t. If you don’t, maybe time for you to leave. If a Grand Master makes a mistake, it will be ironed out at the annual meeting. For all you other Grand Lodges of the USA. It is time to take back what should be yours. If you Grand Masters have gotten used to being a door mat for the Shrine, shame on you. Maybe you need to develop a backbone and read your own by-laws and rule by those. Not someone else’s by-laws which they ignore at their leisure. And for those who have forgotten what it means to be a Master Mason, wake up. Like so many others, I became a Mason so I could join the Shrine. But that doesn’t mean I ignore one for the benefit of the other. For the time being, the Shrine gets no dues from me. And don’t even bother with the “guilt trip” of what about the children. You few actually think the rest of us are not aware? You want to heap blame on someone, look to Shrine International. They are the ones forcing this issue. Not Michigan or Arkansas. And to Utah, what’s up with the wait and see? Get active, not reactive. Wrong is wrong and Shrine is wrong in this situation. It is they who are jeopardizing the organization. It is nice to sit back and be oh so righteous and let others do the battle. So much for Utah and their self serving “high” ground. Get a backbone and decide if you are a Mason first or a Shriner. In my opinion, the Grand Lodge of Michigan has done the right thing (by adopting the laws of the Grand Lodge), considering, by his own free will and voluntary admission of guilt, Mr. Craig Hatch, at the present time, is guilty of crime. When and if the legal process will be reviewed `, and` will `recognized, not guilty, then, only then, will have to be readmitted by the Grand Lodge. Whether you agree of disagree with the actions of the Grand Master of Michigan in this case, what is at issue here is pretty clear. Eventually the Shrine, if pushed too far by too many GL's, will cut their ties to Masonry as a presrequisite to Shrine membership, therby denying any GL any jurisdiction over Shrine Members. Should Grand Lodges choose to retaliate by suspending or expelling members of the Shrine from their Lodges, for no other reason than Shrine membership, the combination of membership hemmorage AND bad publicity for Freemasonry (expelling Masons for membership in the Moose or the Lions Club anyone?) would be a case of shooting ourselves in both feet, with a double-barreled shotgun. It is time for inflated egos to be put aside, and the Fraternity to adopt the universal rule of civilized behavior: "your roof, your rules". Attempting to forbid Masons from attending functions of ANY organization outside of the Blue Lodges of which they are a member in good standing is a slap in the facte of EVERY Mason in the world, and COULD result in the trial and expulsion of the Grand Master the day he leaves office, for abuse of power. Multiple men who been elected and installed as a Grand Master of a Grand Lodge are not Past Grand Masters, as they have been expelled from the Fraternity for their actions while in office. Election as a Grand Master is not equivalent to being elevated to Diety. It really boils down to this: Is the Shrine a Masonic Body or not? If it is, then there should be no controversy. You WILL adhere to the edicts of the Grand Master. If it is not, then the answer is likewise simple. Anybody can join a club, but the Masonic Order is within it's rights to ascertain that that body is no more related to Freemasonry than the Kiwanis Club. The Shrine has a choice. Either have the great benefits of a close association with the Lodge, or sever that association nation wide and live by its own rules. The shrine should obey the laws of the Grand Lodge and The Grand Master should simply convene a trial and be done with it. Then there can be no argument on that point. They should hold a trial. Heck do it at Port Huron #58 they love that type of thing.